"My next term paper was titled 'Socrates and the Bronx.'" Roderick Michael, '80, speaks about how Bard College turned him into an open-minded, well-rounded person and mentor for his students. He also recalls his experiences being a student of color in the seventies at Bard, being introduced to types of people he didn't know existed, and his engagement with professors at Bard. In particular, he remembers his Latin professor, who found a way to drive Roderick to greatness in his class after he caught Roderick cheating. 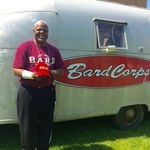 Michael, Roderick D., "Roderick Michael, '80 (BardCorps)" (2016). Oral Histories. 41.